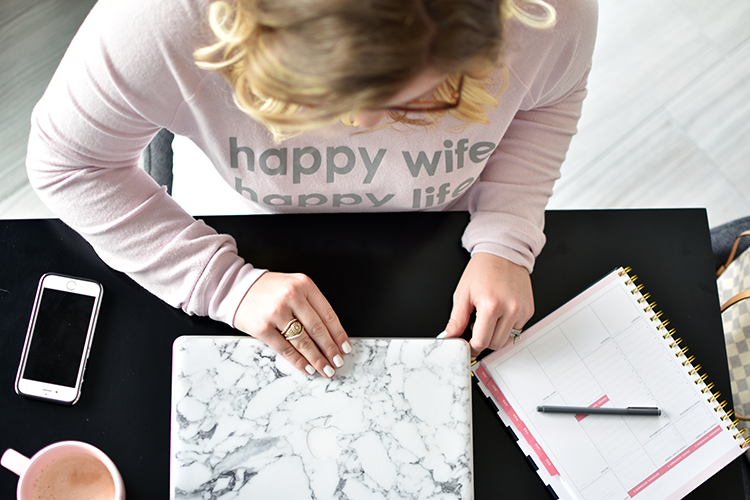 Mrs. on the Move : Five Tips on Working from Home + A Giveaway! 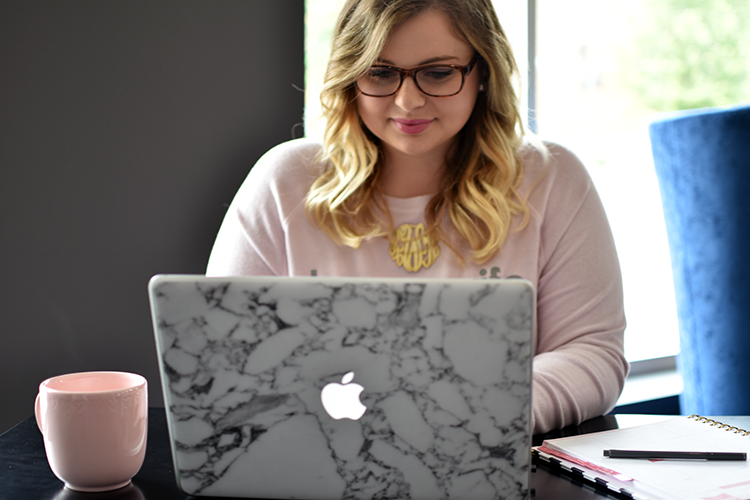 Five Tips on Working from Home + A Giveaway! The transition to working and communicating online has lead many jobs and even whole companies to allow their employees to work from home. While most people find this to be the ideal work environment (hello working in athleisure wear! ), it comes with it’s own set of unique challenges. Finding the right schedule and work habits can be a little difficult, so I thought I would share five tips to be productive while working at home! I’m a Type A through and through, so making schedules and lists is pretty much second nature to me. I generally sit down Sunday evening and take a look at my calendar and list of things that I know have to be done that week and set my schedule from there. It also helps to know when you work best. I’ve found that this is totally different for everyone, so there really is no right or wrong time to get your work done! For me, mornings are typically better to run errands and do things around the house while afternoons tend to work better for me to sit down and write posts, edit photos and answer emails. I’m the type of person that is easily distracted by chores and errands, so it’s better if I just get them out of the way so I can give all my attention to whatever it is that I’m working on at the time. Setting boundaries for both yourself and others is vital to success when working from home but it is also one of the hardest things to accomplish. Answering texts and calls that don’t pertain to work, turning on the TV, running errands and browsing social media during the day is an easy habit to fall into but extremely difficult to break. However, if you set boundaries early on, you and your family/friends will know what expect. My biggest weaknesses are browsing social media and phone calls. 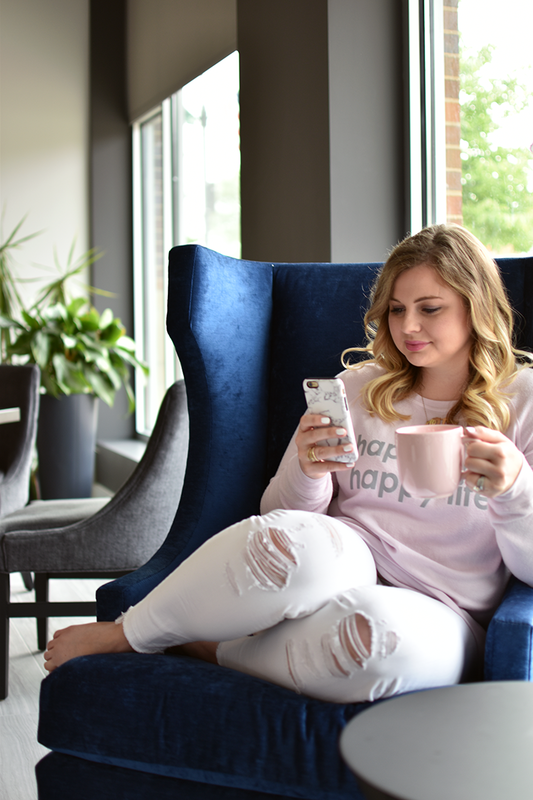 Social media goes hand in hand with blogging, so it’s hard to draw the line between what’s for the blog and what is for my own personal enjoyment. To help combat this, I use schedulers to post my own social media and have designated time to research and interact with others in my particular niche. When it comes to talking on the phone, I try to make time for those in the morning since that is the time I have reserved to get my daily stuff done that doesn’t pertain to work. Whether you’re in a traditional office space or working remotely from home, you have to make activity an important part of your day. I’m not saying you need to go workout on your lunch break (more power to you if you do this! ), but a quick 15-minute walk around your building or block can do wonders to clear your mind and help you refocus on your work. Pecan kindly reminds me to get up and get outside, but if you don’t have a four legged friend staring at you, set a little timer or alarm on your phone that reminds you it’s time to get up and move! Our generation tends to glorify being overworked and that is something I will never, ever understand. 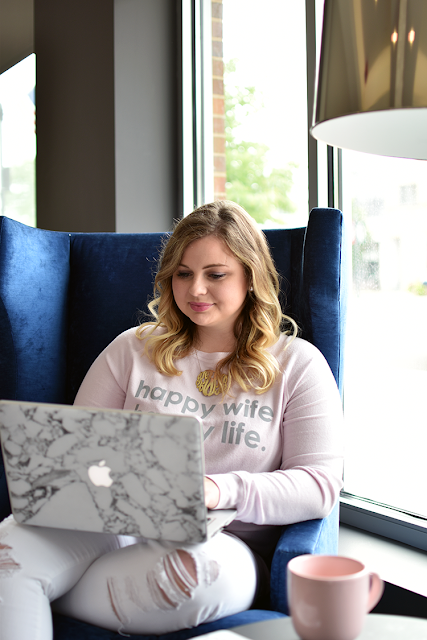 Don’t get me wrong, I like to stay busy and tend to get a little stir crazy if I don’t get out and do at least a few things a day, but setting a time that you shut down your laptop and email is crucial to keeping yourself mentally and physically healthy. There are plenty of apps out there that help you manage when you “shut down”, but I just made a few minor modifications that have helped tremendously. Most recently, I turned off push notifications for my email on my phone and it has been one of the best things I’ve done in a while. Before, I would constantly hear my email notification go off and know there was something waiting for my attention. Now, I have to physically go into my email app to load new emails. I can answer things in the times I have designated for emails which has helped so much with the anxiety that stems from seeing an email but not being able to respond right away. Putting my phone in sleep mode is another trick that helps a ton when it comes to shutting down. I have the schedule set for my phone to go into sleep mode right before I go to sleep and to turn off of sleep mode right after my alarm goes off in the morning. Putting your phone in sleep mode only allows your favorite contacts (be careful who you put on that list!) and people who have called more than once to reach you. Trust me, no one will be that upset you waited until the morning to answer them! 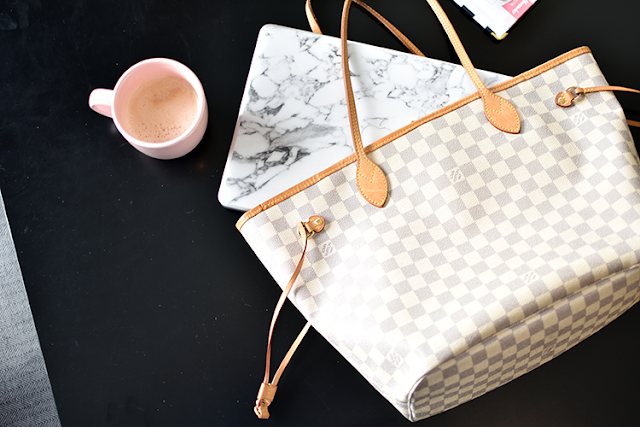 It’s a proven fact that productivity is directly related to having a pretty workspace. Okay maybe that’s just me, but whatever helps, right? My designated workspaces are typically our counter, a table in front of our couch and the lobby downstairs when I have printing to do. Some people can work from their couch or bed, but I always end up distracting myself when I get too comfortable. It’s all about finding what works for you, so if that means your couch, more power to you! 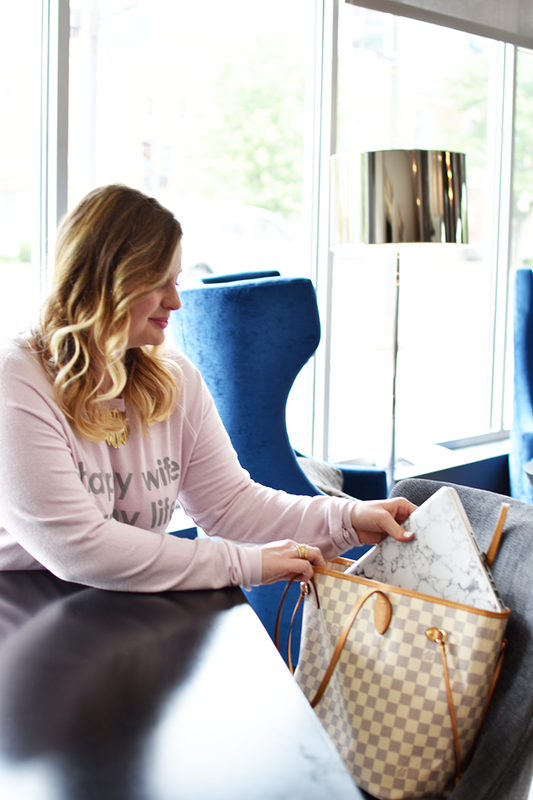 Because I don’t have a traditional workspace like an office or desk, I like the things I use on a daily basis to be pretty and inspire me to be creative! 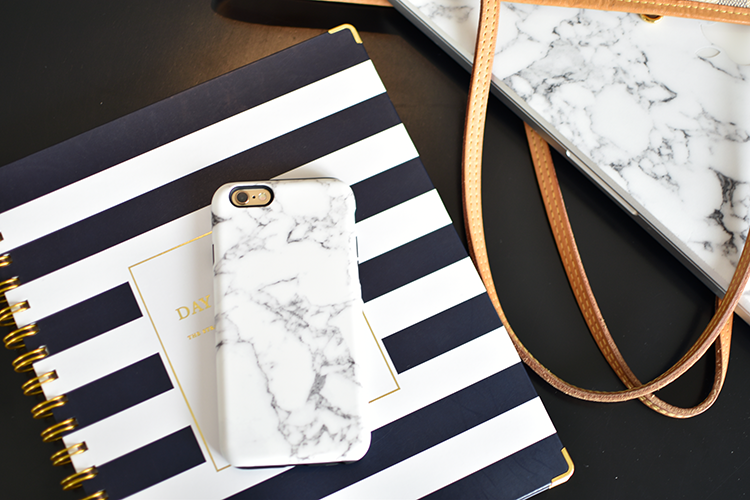 It’s no secret that I love anything and everything marble, so covering my laptop and phone with a custom laptop skin and phone case that looks like marble was a no brainer. My case and skin came from CaseApp, a company that lets you design your own cases and skins but also has a great selection to choose from if you’re not the creative type – which is totally what I did! 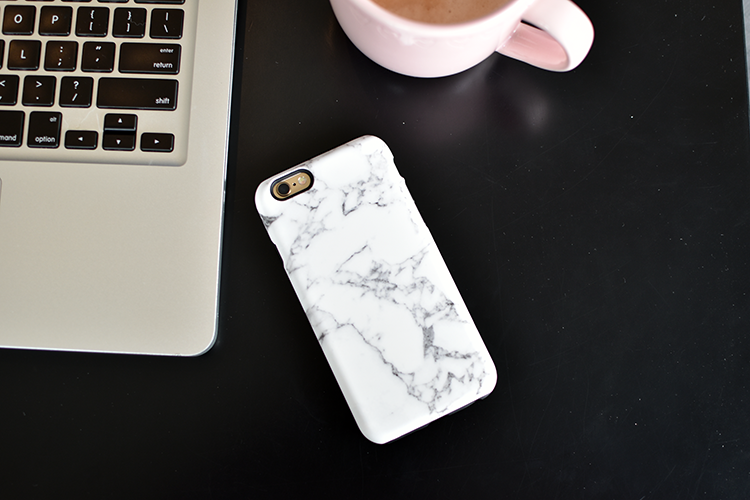 So you can make your workspace pretty too, I’ve partnered with CaseApp to give all my readers a 20% of discount off your order with code MRSONTHEMOVE20, and for one reader, a free item of their choice! To enter, see the rafflecopter below. Good luck!